US-backed SDF says hundreds of ISIL soldiers captured or surrendered while fleeing armed group’s last enclave. US-backed Kurdish-led forces in northeastern Syria captured 400 ISIL fighters who were trying to escape the armed group’s last enclave in eastern Syria. “There are a large number of fighters who are inside and do not want to surrender,” said the SDF commander. Scenes of surrender, humiliation, and anger highlighted the desperation of the armed group as its last major bastion in Syria teeters on the edge of collapse. The evacuations came as the US-backed force slowed its latest push on Baghouz, east of the Euphrates River, to allow people to leave the enclave. Angry civilians evacuating from Baghouz chanted “Islamic State will remain” – underscoring the defiance of ISIL fighters and their supporters even as their defeat looms. 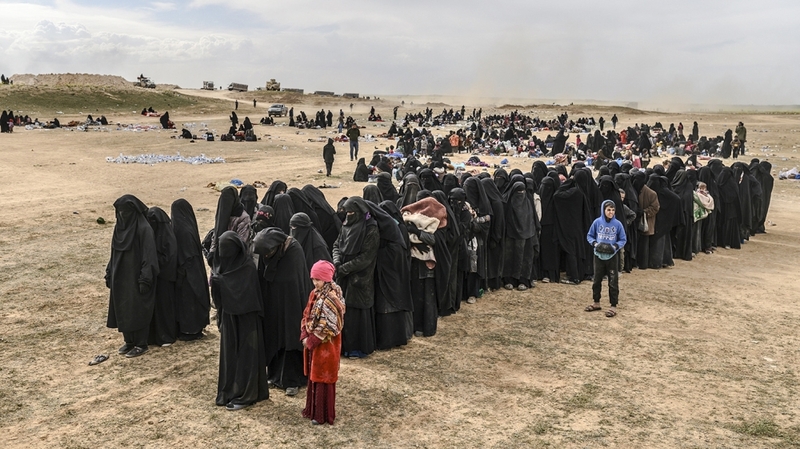 A group of women seen at a reception area in the desert – set up for screening purposes by the SDF – were rowdy, aggressive and defiant, praising ISIL and screaming angrily at journalists. “Islamic State will stay, God is great, God is great, Islamic State will stay,” they screamed. Capturing Baghouz would cap four years of international efforts to roll back the armed group. American Colonel Sean Ryan, spokesman for the US-led coalition backing the SDF, said the international force had “learned not to put any timetables on the last battle”. There were no signs of combat on Wednesday from the ISIL-held pocket of less than one-square kilometre. 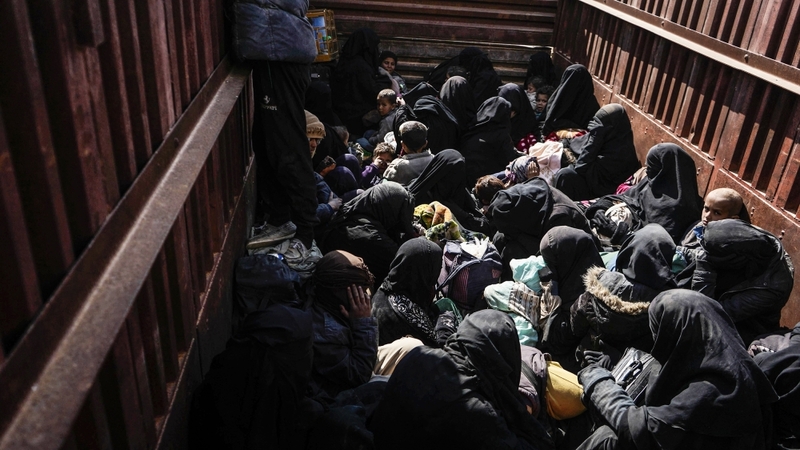 Since February 20, more than 10,000 people have left the enclave, producing scenes of women, shrouded in black, and children climbing off trucks in the desert to be screened and searched. The women and children were then taken to a camp for displaced people to the north in Hasakah’s al-Hol, while suspected fighters were moved to detention facilities. The overcrowded al-Hol camp has now become home to more than 55,000 people, many of whom emerged from Baghouz weak, tired, and hungry. Aid agencies in the area are struggling to cope with the influx, according to NGOs, including Save the Children. The International Rescue Committee aid group said 4,000 people arrived on Wednesday. Of the 90 people who have died reaching the camp since December, two-thirds were babies or infants, it said. A 30-year-old Iraqi woman said her one-month-old baby, who was sick, died overnight in the reception area from the cold. “I didn’t want to leave except to treat her,” the woman who identified herself as Umm Fatima said..
She cursed the SDF and said: “The Islamic State will remain and expand, God willing,” and walked away. A group of men were seated on the ground, under the watchful eye of SDF fighters, many of them covering their faces with checkered scarves. Many among those leaving on Wednesday appeared to be wives and children of ISIL fighters. But also among those who emerged were 13 Yazidi children from Iraq, looking dusty, dirty and in a state of shock. ISIL subjected the Yazidis to mass slaughter and sexual slavery in what the United Nations called a genocide, after overrunning the community’s heartland of Sinjar in Iraq in 2014. At least 75 men also came out on Wednesday, heading straight to the interrogation area. The SDF announced a military operation to liberate Baghouz in September, but has held off on a full-blown assault after it became apparent that a huge number of civilians were still inside. Syrian military air strikes against ISIL fighters further west, in the country’s central desert, were a reminder of the constant warnings by both Arab and Western officials that the group will continue to pose a serious security threat. After its sudden advance across swathes of Syria and Iraq in 2014, the group held about one-third of both countries, but its wholesale slaughter or sexual enslavement of minorities and its grotesque public killings roused global anger. What's behind the unrest at Al-Aqsa's Bab al-Rahma?